Huseyn Javid (Azerbaijani: Hüseyn Cavid), born Huseyn Abdulla oglu Rasizadeh (24 October 1882, Nakhchivan – 5 December 1941, Shevchenko, Tayshetsky District), other spellings "Husein Javid," was a prominent Azerbaijani poet and playwright of the early 20th century. He was one of the founders of progressive romanticism movement in the contemporary Azerbaijani literature. He was exiled during the Stalin purges in the USSR. Huseyn Abdulla oglu Rasizadeh was born in 1882 to a family of a theologian in Nakhchivan in the Iravan Governorate. After completing his elementary education at a religious school in 1898, Javid pursued his mid-school education in the Maktab-i Tarbiya of Mashadi Taghi Sidgi. In 1899–1903, Huseyn Javid studied in the Talibiyya Madrasah in Tabriz. After obtaining a degree in literature at the Istanbul University in 1909, Javid worked as a teacher in Nakhchivan, Ganja and Tiflis, and starting from 1915 in Baku. Huseyn Javid's first book of lyrical poems titled Kechmish gunlar ("The Past Days") was published in 1913. However Javid was known more as a playwright. His philosophical and epic tragedies, and family dramas introduce a new line of development in Azerbaijani literature. In his literary tragedy Sheikh Sanan (1914), Huseyn Javid philosophized about the idea of a universal religion to lift inter-religious barrier between humans. His most famous creation, Iblis ("The Satan") written in 1918, exposed all oppressive forces as the supporters of "humans are wolves to each other" philosophy and "the 20th century cultural savages", and summarized them in the character of Satan. In his works, Javid criticized any form of colonialism and oppression. During the 1920s and 1930s, Huseyn Javid authored a number of historical epics, such as Peyghambar (The Prophet) in 1922, Topal Teymur (Timur) in 1925, Sayavush (Siyâvash) in 1933 and Khayyam (Khayyám) in 1935. Huseyn Javid wrote during the time of Collectivization and Stalin purges in the Soviet Azerbaijan. In the worst times of totalitarianism, he refused to serve as propagandist of "revolutionary socialist achievements". Javid was arrested in 1937 on trumped-up charges of being a "founding member of a counter-revolutionary group that was plotting an overthrow of the Soviet power". His arrest was a part of the nationwide campaign of purge against intelligentsia. The Soviet government exiled Huseyn Javid to the Far East to the city of Magadan. He died on 5 December 1941 in the village of Shevchenko (Tayshetsky District). Huseyn Javid was officially exonerated in 1956. 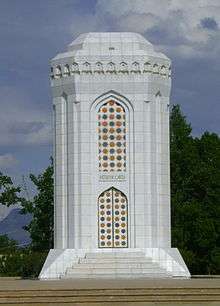 His repatriation came only on Javid's 100th birthday in 1982, when his remains were moved from Shevchenko back to his homeland of Nakhchivan and reburied in a mausoleum built in Javid's honor. Monument to Javid was built in King's Park in Podgorica in 2013. ↑ "Oil Boom Period in Azerbaijan: Husein Javid," Azerbaijan International, Vol. 7:1 (Spring 1999), pp. 20-21. ↑ "Aliyev Memorializes a Literary Giant," Azerbaijan International, Vol. 4:4 (Winter 1996), p. 37. Wikimedia Commons has media related to Huseyn Javid. "Husein Javid: The Night Father Was Arrested," by his daughter Turan, Azerbaijan International, Vol. 4:1 ( Spring 1996), pp. 24, 26.